Outlaws, both. Ned Kelly was a bushranger; Jesse James a bushwhacker. They were contemporaries, (Kelly, 1855-1880; James, 1847-1882) but Ned Kelly was from Victoria, Australia, Jesse James from Missouri. There are a number of parallels in their stories. 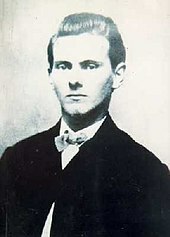 I just finished reading Peter Carey’s True History of the Kelly Gang, and I couldn’t help thinking of the most famous American outlaw, Jesse James. I grew up being fascinated by Jesse James because he was from Kearney, Missouri, where my dad grew up and where some of our family still lived. Mention was occasionally made of ‘the James place,’ which wasn’t all that far from the ‘Carey place’–my dad’s family home. (Writer, Peter Carey, btw, is Australian; no relation to me or my dad’s family…just an odd coincidence in this post.) 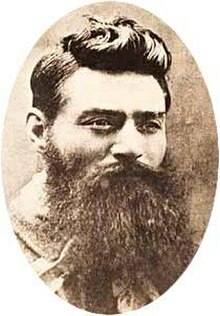 Anyway, to get back to the point… When I got to Australia and began to learn about Ned Kelly, famous bushranger and folk hero, I naturally thought of him in the same way as James. I suppose the overriding question in my mind has always been: Why have we made folk heroes out of outlaws? What’s that about?? Both men were hugely popular with a large segment of the community and often relied on that to help avoid detection. They were seen as heroes and adventurers, and no doubt some people applauded their political agendas. Ned Kelly is famous for wearing a peculiar, homemade suit of armor. Jesse James never did anything so flamboyant as that, but he did on at least one occasion wear a KuKluxKlan hood. The year is 2010; the place is the (very crowded) waiting room in Purgatory. The magazines are all pre-1948. Two bearded, bedraggled men notice each other across the room. One has just arrived; the other seems to have been there for a little while. He hasn’t found a seat yet, but he has worked his way closer to the (empty) water cooler, in hopes it gets refilled at some point. His neck is red and bruised, his eyes bloodshot. He watches the newcomer enter and look around the room as if hoping to find someone he knows. A relative, perhaps. He sees that the new man has a big, ugly bullet hole in the side of his head. Bloody hell. The newcomer sees the man near the water cooler and thinks he recognizes him. He starts toward him, then realizes his mistake and turns away. Pushing his way through the crowd, he continues looking. After a while he gives up. There are just too many people. Eventually he finds himself standing near the man he first mistook for his brother, Dan. The one with the beard, over by the big empty jug. The man is dressed strangely, in what looks like pajamas with arrows all over them. And his neck is red and badly bruised. He looks like he’s been hanged, thought James. He noticed the man looking at him oddly. Probably just noticed the bullet hole, he thought. The man appeared to try to nod, or give a jerk of the head, to call him over, but the effort wound up just making his head flop over in a most unseemly manner. But James thought he understood. He started pushing his way over to where the man stood. It took a while, but he finally managed to reach the man. “I’m Jesse James,” he said, offering his hand. “Ned Kelly,” said the man with the floppy neck. “What is this place?” asked James, looking around. He seemed completely unaware of the effect the bullet hole in his head was having on the people around him. “Sure. I’m a Methodist. I’ve heard of purgatory, but I never heard of — what was it you called it, agivital? purgatory?” replied James. “So what are you doing here, then?” asked Kelly, looking at the bullet hole. “On account of Robert Ford, the coward. He tried to shoot me in the back, but I turned my head when I heard the gun click. That’s why he got me in the side of the head. We were supposed to be planning a job, but he was spying for the governor, hoping to collect the reward. An adjectival coward,” said James, grinning. “So what were you doing? Were you a bushwhacker too?” asked James. Kelly laughed–more of a snort, really. “Mate, this isn’t purgatory. This is the waiting room to get into purgatory.” Both men stood silently for a while, thinking things over. “So what took you so long to get here if you died in ’82,” asked Kelly finally. “I been outside, waiting to get in here,” said James at last. I’ll immediately take hold of your rss as I can’t in finding your email subscription link or e-newsletter service. Do you have any? Please allow me know so that I may just subscribe. Thanks.